THE PICKIEST EATER IN THE WORLD: STARTING THE NEW YEAR AT F1 HOTEL MANILA WITH THE KTG! STARTING THE NEW YEAR AT F1 HOTEL MANILA WITH THE KTG! 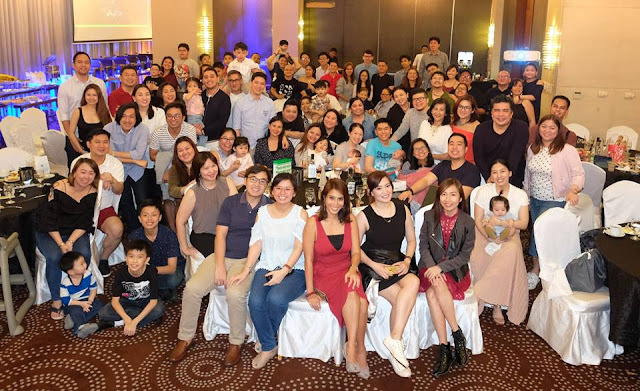 For the past few years, My blogger family known as The KTG has celebrated our Christmas Party at F1 Hotel at Bonifacio Global City. This is only fitting because it pretty much was the place where our Blogger Collective was born, and we now consider it the Home of The KTG. For the past few years though, we decided to avoid the December rush and instead, celebrate it during the first week of January.. Which coincidentally happens to be the week of two major events for me, namely my Wedding Anniversary, and my Birthday, making the Party at F1 Hotel extra special! During The KTG's 2018 Holiday Party, not only did we usher in the new year with a bang, we also welcomed Chef Chubby Timban to the F1 Family, as their new Executive Chef! Chef Angelo "Chubby" Timban is no stranger to the service industry, having worked the kitchens of some of the most renowned establishments in the country, including Resorts World Manila, Discovery Suites, Shangri-La Boracay, Traders Hotel, and Manila Pavilion. He is also won the Gold Award during the Philippine Culinary Cup 2014, and was the Silver Awardee at the National Food Showdown 2014, during the Chefs War Regional. He had also been an active participant of the World Food Expo from 2003 up to 2010. He now takes the reins of F1 Hotel Manila's kitchens, particularly F All Day Dining at Canary Lounge. As The KTG visited F1 during the new year, this was the perfect way to taste Chef Chubby's food for ourselves. And I must say, F1 Hotel is in good hands. Rain annihilated a whole plate of these bad boys. This was incredibly flavorful even without sauce, with the skin possessing a gorgeous crackle, and the unbelievably tender. The savoriness of the tender slices of beef was perfectly complimented by the luscious Red Wine Sauce. This was AMAZING. The pork had nice linings of fat on it, with the pepper crust offering a zesty zing of flavor. The Beef Ribs Adobo was a delicious take on the classic Pinoy dish, using chunks of succulent Beef Short Ribs instead of the traditional Pork or Chicken. I was expecting the Gochujang Chicken to have a fiery kick to it, but much to my delight, it wasn't too overwhelming. The presence of Chili was undeniable, but the natural flavor of the chicken meat still shined. Other seafood items available were the Grilled Squid Lumol.. The Dessert Selection consisted of several cakes, pastries and Mousses, with my favorite being the mini Doughnuts! ... And the Bread and Butter Pudding with Cream Sauce. Rina also enjoyed the Halo Halo Station, where she customized her shaved iced treat to her liking! The lovely ladies of the KTG enjoyed their sumptuous lunch, setting the stage for what would be an epic dinner spread during the KTG Party! Chef Chubby's Pasabog for dinner was the Stuffed Beef Belly with Black Forest Sauce. In case you were wondering, it tasted as amazing as it looked. Through the years, The Plaza Premium Baked Ham has become a KTG party staple. To the point that any party I go to nowadays, doesn't feel complete without it. I love grabbing slices of that delicious, glazed meat, stuffing it in between a toasted Pan De Sal, and slathering the bread with the Original Glaze and Honey Mustard Sauce, as well as the Garlic Mayo! They're also a whole lot more than just ham, they also provide catering services, with their other dishes nothing short of spectacular! Like The Plaza Premium Baked Ham On Facebook! Like The Plaza Catering on Facebook! Le Petit Fromagerie brought in their spread, consisting of an impressive selection of Cheeses, breads and crackers. Each cheese seemingly tastier than the next, but of course the star of their feast was.. I think I must have gone back four or five times for a plate of this! Like Le Petit Fromagerie On Facebook! I'm not much of a drinker, but from the way that Rina and the other members of the KTG downed those Mojito Slushies from Swizzle Mobile Bar, It's pretty safe to say they were quite delicious.. and considering that everyone suddenly had the courage to get up and sing Videoke, the drinks packs quite a punch as well! Like Swizzle Mobile Bar on Facebook! I was surprised to see that one of the leading names of Milk Tea in the Philippines offers party set ups! Serenitea set up a Booth during the party, giving everyone a fill of their famous Milk Teas! The Milo Flavored one seemed to be the most popular! If you're interested in setting up a Serenitea Booth for your party or event, check out their Facebook page for more information! This was an incredible way for the KTG and other guests to welcome 2018, hoping that our food blogging family will all be blessed, as we were in 2017! Once again, thank you to F1 Hotel Manila for their graciousness, and we look forward to seeing more of what other gastronomic creations Chef Chubby has in store for us! Like F1 Hotel Manila on Facebook!